Tchaikovsky’s first opera The Voyevoda – not, it should be emphasised, the same work as his much later ‘symphonic ballad’ – was first performed at the Bolshoi in 1869, when it had a run of five performances. Although it was favourably received in some quarters at the time, the composer withdrew the work (which was never published) and recycled some of its material into such works as Swan Lake, his later opera The Oprichnik, and even the 1812 Overture. He then destroyed the original score, and it was not until long after his death that the opera was reconstructed from his sketches and the surviving vocal and orchestral parts — as also happened with Rachmaninov’s First Symphony. It appears that there were two such editorial versions: the first was made by Sergei Popov in 1927, and a later edition then appeared edited by Pavel Lamm. It is perhaps to be expected, in view of Melodiya’s miserable presentational material of which I have complained over the last couple of years, that the booklet here fails even to inform us of the existence of two independent editions of the score. It merely states that “during the Soviet era The Voyevoda was reconstructed from surviving manuscripts”. As for which edition is employed in this issue we are left to guess. Fortunately the invaluable ISMLP site furnishes us with both the full score and a vocal score of the opera in the Pavel Lamm edition. From the evidence of this it would appear that it is this version of the score that it employed in this recording. It was made in 1982 but never appears to have been available internationally, and this would seem to be its very first appearance on CD. Like other such recordings from the Soviet era, it has therefore an immense value in its own right which is utterly undermined by the failure to provide any sort of detailed information about what is going on at any point in the action – just a brief uncued synopsis of less than two pages which summarises the plot of Act Two, Scene Two (which lasts nearly half an hour) in three laconic sentences. Furthermore the style of English employed is far from idiomatic: track titles include “A duck swan on the sea”, “You live on my yard, Roman, but never shows your face,” “My zealous heart I sick” and “Here come the boyar with his daughter”. For a work that will be totally unfamiliar to nearly all listeners, this is simply not good enough. The scores on the internet provide no languages other than the original Russian, so they cannot help even those who can read the music but don’t understand the language. Having got these complaints off my chest — and I will continue to complain for as long as Melodiya undermine the value of their reissues with such inadequate presentation — what of the work itself? Well, it is clear that Tchaikovsky himself thought little of it, and it is obviously an apprentice work; but the composer already demonstrates his aptitude for characteristic orchestration, and the melodic material is fine and sometimes considerably more than that. The appearances of themes familiar from Swan Lake and 1812 are occasionally perturbing, but it is interesting to hear them in what Tchaikovsky conceived as their original context. The plot, insofar as one can make sense of it, is far from dramatically cogent, a tangled web of jealousies and misunderstandings with a rather contrived happy ending. Here the role of the people as the deus ex machina who bring about the reconciliation at the final curtain harks back to Glinka, and Tchaikovsky understandably finds it difficult to breathe much life into the cardboard characters who occupy the foreground. The performance, about which one can make judgements on the basis of the score, is a very good one; Vladimir Matorin is excellent in the title role, and although in the remainder of the cast there are some instances of the typical Russian vibrato none of them are serious enough to be qualified as a wobble. The recording is bright and over-engineered in the typical Soviet style, but everything is clear and audible. The orchestral playing includes its fair share of watery Russian horn style — particularly noticeable in the horn solo which opens the opera — but this too is part of the idiom which one would expect. Vladimir Kozhukhar clearly relishes the score, and obtains clarity of ensemble even in the more complex passages. Altogether then this is a most successful issue, torpedoed as so often in the past by Melodiya’s abysmally poor presentation. It is valuable in letting us hear Tchaikovsky finding his feet as an operatic dramatist; and although the composer might not have wished us to examine this process in such forensic detail, it can be regarded as an interesting historical document in more ways than one. 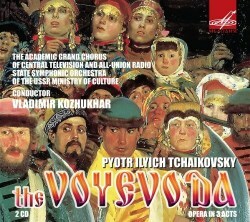 Might we now hope for reissues from Melodiya of other, later and more characteristic, Tchaikovsky operas. I hope that they will come with more helpful background information?